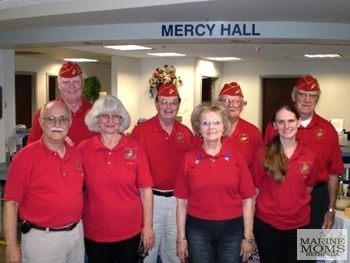 June 4, 2009 – Mercy Hall: It’s a BBQ! Back in January when I mentioned a BBQ to the Sgt., she pointed out there were three charcoal grills out on the patio. 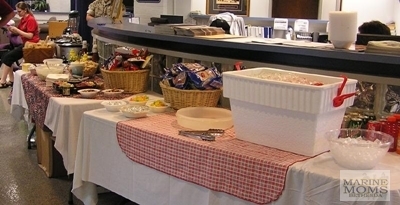 I was riding home with Jack from that luncheon and mentioned a cook-out to him, and he wondered if maybe his MCL detachment might enjoy helping with one. They talked about it among themselves and decided they would so that’s what we did this month. 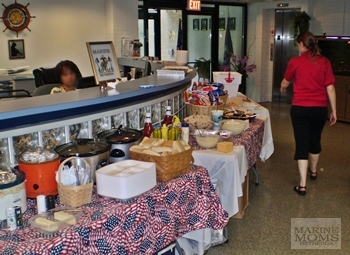 The detachment funded it and the MM-B Crew prepped it, we all set it up together and had a great luncheon for the guys! One thing I forgot to do was check the Farmer’s Almanac for the weather forecast before I asked for this date way in advance. June in Merryland is nice. In fact it’s gorgeous. We’re past the cold, it’s not unbearably hot, and everything is green, lush, and beautiful. We still get May Showers in Early June, though. I had done the shopping here earlier in the day, had all the food, plenty of hamburgers, hot dogs, and kielbasa; even bought marshmallows, chocolate bars, and graham crackers for S’mores. The grocery store even had – GET THIS – S’more sticks!!! Okay so they look like long dowels that had been put in a pencil sharpener. Still cool though! I bought a dozen that the guys could share. Jess had the corn and the pasta salad ready to go. It wasn’t going to rain! I went online to my favorite weather site and punched in the zip code for Bethesda. Plus I don’t have an electric skillet. “I don’t have one.” Uh oh. Chris stopped by with a box full of nifty-gifties to take to the guys. Long story short, we didn’t cookout. The clouds and the weather forecast were just too ominous that morning. Jack, Jim, Donald and Wayne were great sports. 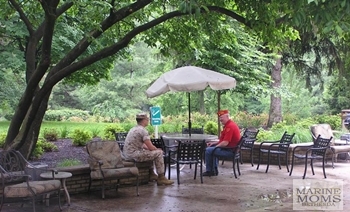 They showed up with their big umbrellas and were ready to flip hamburgers in the rain for the guys! 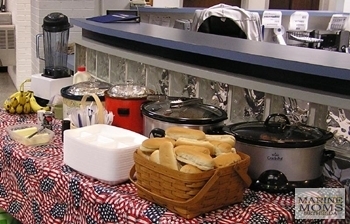 The hotdogs, kielbasa, and corn on the cob went into crockpots, we nixed the skillet idea and I’m buying back the hamburgers and some other things, BUT I’m saving the S’more stuff for the next Mercy Hall luncheon. Jess and Bob rode together and arrived about a half hour before the rest of us did, checked in with the Liaison office and Mercy Hall, and did a table safari. We arrived, unloaded, got situated and by the time Wayne and I returned to Mercy Hall from parking the cars, all was under control. Jess had assigned jobs to everyone and with Bob’s help they had just about everything set up. Jess doing her “final inspection” of the tables. What’s a barbecue without a watermelon? 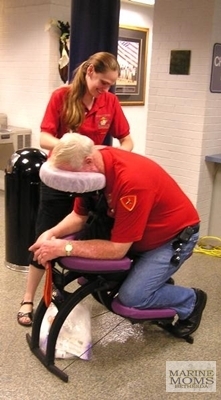 After everything was ready, Jess began assembling her seated massage chair as a Marine patiently waited for a free massage. There was time for one of the “Elfs” to have a turn. 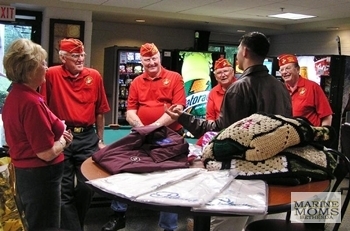 As Marines began coming in for lunch Pat handed out notes, Dunkin Donut gift cards from Chris and phone cards from Judy. 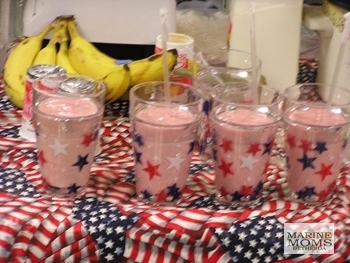 We had some shirts from the Choptank MCL detachment to give out, and special smoothie cups for the guys to keep thanks to WA State Operation Thank You. There were also absolutely awesome homemade pillowcases from Bayside Quilters, and beautiful afghans from Esther and Her Ladies. There were stories to share. There was some quiet time for conversations. It didn’t rain while we were there. We could have fired up the grills. 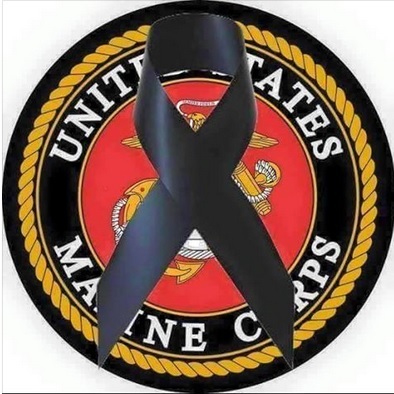 Among the guys we met, there were Marines from South Carolina, Wyoming, and Maryland. I like to ask the guys where they are from, and they get this far-away look in their eyes. One thing they love – their hometown. And their families. You all mean so much to them… maybe more than you know. 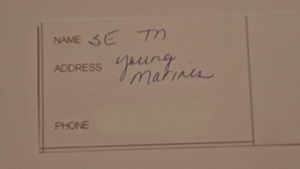 I warned the Marine Corps League that it’s always an adventure when we go to Bethesda and it was! 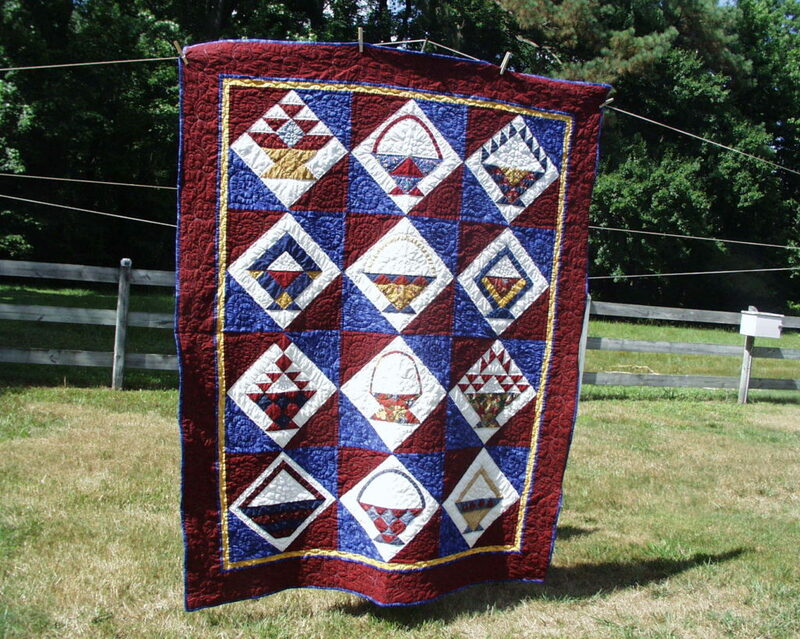 Please check out Marine Moms-Bethesda “Baskets of Love” Quilt Raffle. 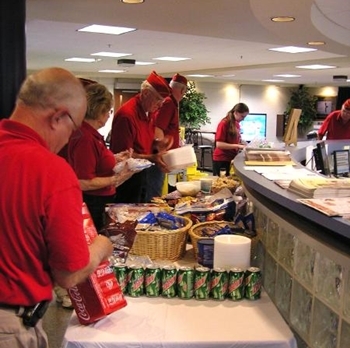 All funds raised from it will support our monthly luncheons, gift bags and pantry items for Mercy Hall and 5 East. 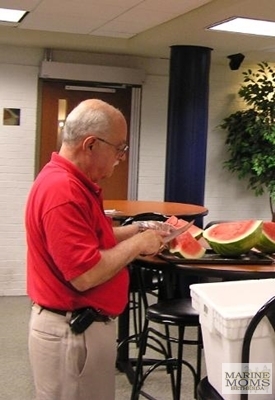 Previous PostApril 5, 2009 – 5th FloorNext PostJuly 12, 2009 – 5th Floor: What’s better than watermelon on a hot summer day?